Raising money for the Annual Tichigan Fireworks has always been a challenge. In 1986 the fireworks almost ended. There were only three committee members left and two of the committee members did not want to volunteer after that years fireworks display. That left Barb Krizan, the only committee member left. Barb did not want to give up the fireworks, since her father Erwin Kruschev started the fireworks back in 1971. She felt that they were still an integral part of the area's summer. She didn't know what to do, so she placed an ad in the Waterford Post for volunteer's for the fireworks committee. A few people did respond to her plea. Lack of committee members wasn't the only problem. There were some financially lean years in the late 1980's and early 1990's. At one point the committee had a profit of only 40 cents. There were also some years that the committee members thought they would have to dip into their own pockets to put on the Annual Fireworks Display. The Fireworks Committee has several fundraising events throughout the year including, the New Years Day Tush Dip, the Annual Tichigan Fireworks Valentine's Dance, the Uff-Da-Golf Outing and the Golf Outing at Edgewood Golf Course. The committee's biggest fundraisers are the Valentine's Day Dance and the Golf Outing at Edgewood Golf Course. Every year the Fireworks Committee also sends out postcards to the area residents asking for donations. They also place donation canisters in some of the area businesses. To put on the Fireworks in 2014 the cost was $15,000. This year's fireworks are projected to cost about $16,000. We Would Appreciate Your Donations. 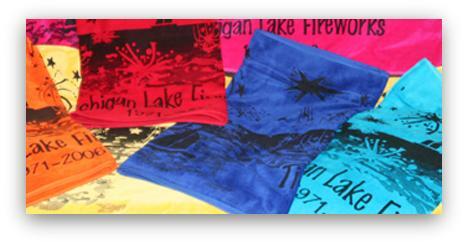 For more information on upcoming events, merchandise for sale, or this year's fireworks, please email us at: info@tichiganlakefireworks.com or visit us on Facebook!